The Rocky Horror Picture Show star Patricia Quinn stars in ’TIL I DIE, a new play by critically acclaimed young writer Benjamin Cooper at the Old Red Lion Theatre from 8th September 2009 for 20 performances only. The story of a friendship forged at the football ground and fortified through the love of violence. ’TIL I DIE follows the passionate friendship between two young men, Danny and Lee, who live for each other, for the beautiful game and for its ugly and violent sub-culture. A compelling, genuine and disarming new play about love and loyalty in a fractured society. 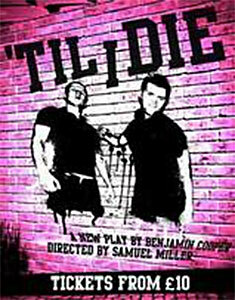 ’Til I Die is written by Benjamin Cooper and directed by Samuel Miller. The cast includes Sebastian Hurtardo, Cai O’Leary, Leona O’Sullivan and Patricia Quinn. When I first read the description of the play I wasn't sure if it would be something that would appeal to me, however last night proved to be a most enjoyable evening of theatre. The play charts the lives of two young men, who on initial impressions are shallow, violent, drunk yobs. As we follow the lives of Lee and Danny we are drawn more and more into their values and dreams, and as the audience we come to realise behind the bravado and posturing they are just trying to find their place in the world. Underlying all this is the loyalty and love they have for each other, expressed mainly by their shared support of their beloved football team. It's left to the audience to decide if their love for each other is, or could be, something more. Danny also cares for his mother played by the ever wonderful Patricia Quinn, while Lee's relationship with his girlfriend (played by Leona O'Sullivan) starts to become more than he wants. Lee also plans to join the army, leaving behind his life and the place he grew up in. All the actors gave excellent performances, I was drawn into their stories and left the theatre wanting to know what happened to the characters next. Despite some of the language and violence that goes with the football theme, the play also offers plenty of laugh out loud moments and has a certain amount of wit to it that does not happen at the expense of the characters themselves. A huge round of applause at the end of the play was more than deserved. The Old Red Lion Theatre is an intimate space, with bench seating along two walls and the minimal set and well planned lighting was used to great effect as we travelled from one scene to another. I wouldn't wear too many layers though as the theatre does get a little warm with fifty or so audience members filling the seats. I love the fact that the theatre in accessed through the pub itself, normally you'd find juke box in the corner rather than a box office! Overall, highly recommend and I say that not just as a Rocky fan. Patricia Quinn is wonderful in her role, as are all the cast, but the play is very much the thing. See it while you can, there are only twenty performances scheduled at present.